I treasure this photograph. I wouldn’t know what the occasion was but the clues tell me it’s a birthday celebration – possibly Annie’s? There’s something particularly precious to me about photos of my Annie before I knew of her. Although it’s true, I have fewer of those photographs in my possession than I do of those when I knew her, it’s not simply scarcity or rarity that increases their value to me. It’s something much deeper and loftier than that. I made mention recently of a long-term labour of love I have assigned some of the long winter nights to; to sift through a box full of digital storage media and archive every photo or video I have of my Annie since we were married. My plan is to file them into folders organised by month within year. It’s usually a simple process if the image file has a date-stamp. And when that’s missing, there’ll always be some visual clue in the photo, which when I filter it through the archive of my memory, will eventually allow me to pin a year, a month and probably even an occasion on it. There’s an immediacy to looking at recent photographs; I look, I locate, I recall and replay and I smile and then I move to the next photo and I do the same all over again. But there’s something about the fact that I can’t attach these older photos to a personal memory – no shared folder into which I can place them – that makes me gaze longer and deeper into them. For me, these are not photographs that evoke memories but rather invoke my imagination and create new feelings and reflections and longings as I stand outside looking intently in at my girl. Just last Sunday, we were singing the words to that hymn ‘In Christ Alone’ and that line above triggered the memory of this photograph. 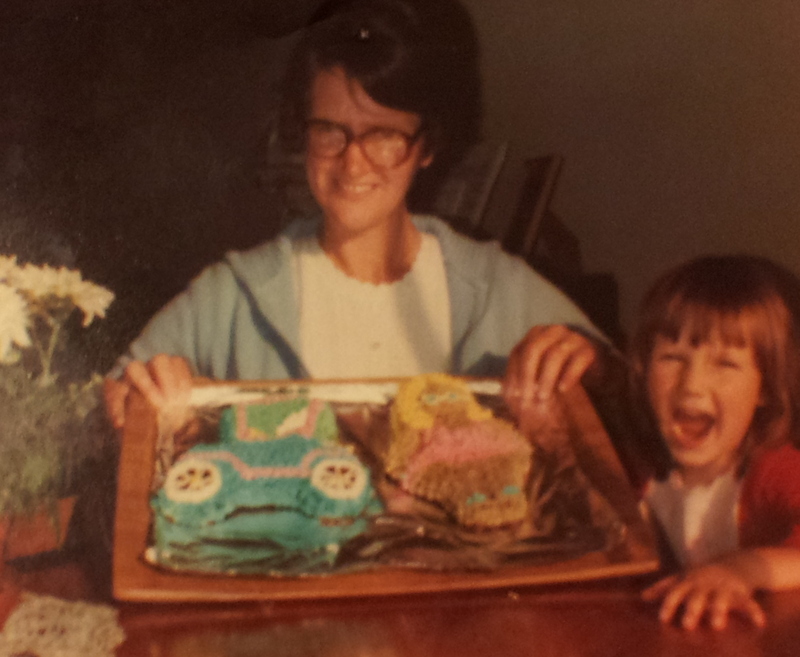 I got home and I gazed again into that picture taking in the smiles, the happiness, Annie’s expression of uncontainable excitement, that birthday cake; then a sadness, a deep brooding, consumed me. So happy and yet so unaware of the painful years that would unfold. Neither could ever have known that Mom Ruth would indeed witness all of her daughter’s birthdays; she would be a mother – even a widow – who would literally witness her dear daughter’s first cry and final breaths. This old photograph doesn’t have a timestamp, but it does have a fixed place in time relative to me. Before God said “Let there be light!” He already had a plan for our lives; in grace and in love He had already decided “Let my daughter, Annie and my son, Ryan become one flesh.” There is something gloriously cosy and secure, about knowing you were on the mind of the eternal God before time was conceived. This might sound really strange to some of you reading this, but I can testify – just in the same way that my Annie could testify the same thing in the grips of cancer – that all the pain I have experienced so far is producing praise to His glory! In Christ, increased pain, increases peace and praise. This is the power of Christ in me! Just recently, I realised something as I was looking at a photograph of my Annie. I realised that when I think “Oh how I miss you!” it is always accompanied by a silent assurance that while the pain of missing her increases every moment, the period also decreases. There is a sense in which I miss her more every day and less every day. Let me illustrate what I mean with a true story. That is precisely how I feel right now. I miss her more each day and less each day. Pain and hope, sadness and joy, tears and peace increase together with each moment of time that passes, until the latter of the two surpasses the former forever! There is a thirty-three year period in the history of time on which my eternal hopes are grounded! Jesus, the Son of God has come to this earth ‘Emmanuel, God with us!’. He has lived and breathed, walked and talked. My hopes have a pulse! There is a specific three-day period in the history of time which places and weaves all my years and my Annie’s 36 years, and Mom Ruth’s 67 years into the framework and fabric of eternity. There is a unique Sunday morning in the history of time which assures me that one day I will see my dear Annie again and even more, I will see my Saviour, my Lord and my King with my own eyes. Tomorrow is the first Sunday of advent. A time when I will be remembering that when God says He is coming, He means it! It’s a time when I will rejoice in what I already know because He is here, with me in this coffee shop right now, Saturday, November 30th, 7:59pm. He’s coming again. Are you ready? Being ready doesn’t mean being religious. It means being happy in and under the Kingship of Jesus in all your life. There’s nothing better than having His Kingly Presence in your life. Ry, I only just got round to reading this, it has filled my brief lunch break with such joy today. That would be a strange word to be using if we didn’t have a living Hope beyond this here-&-now. Jesus only, Jesus ever… Remembering you. I sat and thought of dear Annie at school the other day…a lovely warm feeling..i was sat at a table and the kiddies were out playing…a really nice calm happy /sad moment …lasted about 6 mins…hope you and Milo are keeping each other company….hugs….x…x….